That lovable Gel ndewagen, the German military vehicle almost replaced by the GL-Class familial barge, has gotten a new look. And by "look" we mean you have to really look for the differences. Mainly, the changes are focused in the interior, with a restyled dash binnacle, modified center console, and a newly styled steering wheel. (Seriously, look hard.) Outside, the only telltale addition is that of new, LED-look taillights. New features include a back-up camera for dodging pesky Peta protesters, a tire-pressure monitoring system and new leather upholstery in "Cognac." No, Jeeves, we won't be returning to the castle this evening. Mercedes-Benz has refined its G-Class yet again. The interior has been injected with fresh appeal courtesy of a new, high-grade instrument cluster, an attractively styled steering wheel which is also new, as well as a modified centre console with redesigned switches plus a new-look control unit for the air conditioning. Outside, the latest generation of the G-Class can be identified by the design of its tail light units with their sophisticated LED look. These facelift measures see Mercedes-Benz hold true to its philosophy of making sure that this classic vehicle - which has been in production for over quarter of a century now - is equipped with a comfortable, up-to-date interior on a par with the best saloons, along with state-of-the-art technology. By so doing, it preserves the exclusive status of the G-Class as a full-blooded cross-country vehicle blended with the very finest lifestyle qualities. The first Mercedes-Benz G-Class unveiled in 1979 was designed predominantly with tough off-road terrain in mind. 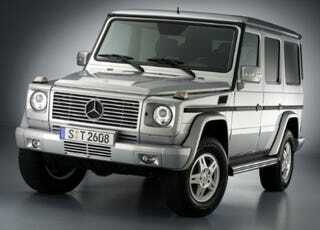 Over the many years of its production, Mercedes engineers have adapted the G-Class to changing customer requirements. It boasted outstanding off-road capabilities right from the outset, but its all-terrain prowess has been continuously improved on by the addition of the latest electronics. Its exceptional performance off the beaten track, excellent towing abilities and balanced handling characteristics combined with its saloon-like ambience have resulted in the G-Class enjoying an extraordinarily long production career, which now extends to 28 years. With its most recent facelift, Mercedes-Benz has added further touches of class to its cross-country classic. This is particularly true inside the G-Class where a new instrument cluster gives the interior a sophisticated look. Four circular analogue dials with chrome-ring surrounds form the nerve centre for driver information. Also sporting a new design is the elegant four-spoke multifunction steering wheel, whose illuminated buttons drivers can simply press with their thumbs to call up various data or control certain functions without being distracted from the road. The G 320 CDI comes with a leather-trimmed steering wheel as standard, whilst the luxurious wood/leather version awaits G 500 and G 55 AMG drivers. Common to all three G-Class models is the modified centre console with its new controls and switches for the air conditioning and convenience functions. Not only does the new centre console give the cockpit added visual appeal, it is designed to make operating the controls more foolproof. The standard specification for the G 500 and G 55 AMG models includes the COMAND APS control and display unit featuring DVD navigation system, built-in radio, CD player and telephone keypad. A compass function has also been integrated to allow drivers to easily get their bearings even when they have left the signposted routes far behind them. The compass can be set to show the current heading in either the new instrument cluster's display or on the COMAND screen. The COMAND APS system can also be specified as an option for the G 320 CDI. This model is fitted as standard with the Audio 20 radio featuring CD player and telephone keypad instead of the previous Audio 10 unit. The entry-level model now also comes with heated front seats at no extra cost. The new 12V power socket in the front-passenger footwell of all models in the G-Class range allows for straightforward connection of auxiliary electrical appliances. From outside, the newest generation of the Mercedes-Benz G-Class can be recognised from its tail lights, which have been remodelled by the designers to give them a fresh, new, LED-style look. In light of these facelift measures, the claim that the Mercedes-Benz G-Class is now more comfortable and innovative than ever has never rung so true. For not only does the G-Class excel by virtue of a luxurious interior ambience, its technology is absolutely state of the art too. The permanent all-wheel drive is complemented by the electronically controlled traction system 4ETS which boosts vehicle grip when pulling away and accelerating on slippery surfaces. What's more, the G Class comes equipped with three engageable differential locks as well as a low-range ratio for tackling tough terrain. The current G-Class model line-up comprises three engines and three different body variants. The engine power spectrum ranges from the 165 kW/224 hp of the G 320 CDI to the 368 kW/500 hp developed by the G 55 AMG. The new-look G-Class is available to order now, with deliveries starting in mid April. Gangstas And Euro-Type Off-Roaders Rejoice! The G-Wagen Lives!